Codex Sinaiticus was found in a trash-can! A debate took place between Dr. Jack Moorman and Dr. James White a year or two ago which can be viewed on Youtube. During that debate James White made the following statements. Having read Tischendorf’s account of his discovery of what we now call the Sinaiticus manuscripts some time previously, Dr. White’s assertion rang alarm bells. So let’s turn to Tischendorf;s account and check out Dr. White on this point. 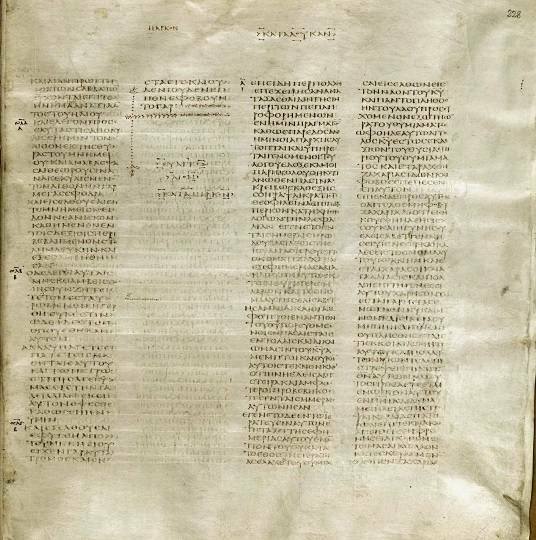 Codex Sinaiticus, The Ancient Biblical Manuscript Now in the British Museum. Tischendorf’s Story and Argument Related by Himself. London, The Lutterworth Press, 6 Bouverie Street E.C. On the strength of these assertions, I believe I hold a reputable account in this volume of the events exactly as they happened. Moving on to page 23, Tischendorf there gives specific details of his first visit to Mt Sinai. “Folks, people in monasteries do not wrap garbage in red cloths, O.K?” says Dr. White. That’s right Dr. White, they burn it! Unless they perhaps get wind later that someone will pay good money for it. We read of third visit at page 26. “..in the commencement of January, 1859, I again set sail for the East…By the end of the month of January I had reached the Convent of Mount Sinai…After having devoted a few days in turning over the manuscripts of the convent, not without alighting here and there on some precious parchment or other, I told my Bedouins, on the 4th February, to hold themselves in readiness to set out with their dromedaries for Cairo on the 7th, when an entirely fortuitous circumstance carried me at once to the goal of all my desires. On the afternoon of this day I was taking a walk with the steward of the convent in the neighbourhood, and as we returned, towards sunset, he begged me to take some refreshment with him in his cell. Scarcely had he entered the room, when, resuming our former subject of conversation, he said: “And I, too, have read a Septuagint” – i.e. a copy of the Greek translation made by the Seventy. And so saying, he took down from the corner of the room a bulky kind of volume wrapped up in a red cloth and laid it before me. I unrolled the cover and discovered to my great surprise, not only those very fragments which, fifteen years before, I had taken out of the basket, but also other parts of the Old Testament, the New Testament complete, and, in addition, the Epistle of Barnabas and a part of the Pastor of Hermas. Full of joy, which this time I had the self-command to conceal from the steward and the rest of the community, I asked, as if in a careless way, permission to take the manuscript in to my sleeping chamber to look over it more at leisure. There by myself I could give way to the transport of joy which I felt. I Knew that I held in my hand the most precious biblical treasure in existence – a document whose age and importance exceeded that of all the manuscripts which I had examined during twemty years study of the subject. And there we have it. When we turn as James White directs us to Tischendorf’s account, we find no such thing as White asserts. No doubt, it was only after the monks perceived Tischendorf’s excitement, that realizing the age of the document, they “would not part with it at any price”, and wrapped it in red cloth. KJV only advocates are right therefore, when we claim that Sinaiticus was found in a waste paper basket. No mythology here! Its unfortunate that the liberal scholarship of Westcott and Hort used this text in 1881 in their critical text. It is still influencing miss translations of today. The Texus Receptus and Majority Text stand supreme. We should know the difference!